So you got yourself a job as a barista in a specialty coffee shop. Maybe you’ve been working in it for a while and you’re really passionate. You start dreaming about a life in coffee beyond the counter. What else can you do? How can you get there? But the specialty coffee industry is a relatively new one and career paths are somewhat mysterious – or at least it feels that way. Luckily, our industry is full of amazing people. They amaze us with their talent, trajectory and enthusiasm. Or maybe because they kindle your passion for the job when the menial daily tasks seem overwhelming and you wonder “Why am I doing this?”. Régine Léonie Guion-Firmin, “traveling AST” and founder of Karibu Kahawa Camps in Kenya, is one of these amazing heart warming people. And she was generous enough to talk to us about her career path to help shine a light on how we can all move forward. Régine came to us in 2017 in between trips to host lessons at Ancoats Coffee for the local coffee community. Affordable lessons, we must add, as they are a rare find. We were taken by her positive character and hard work, charmed by her knowledge in coffee and by her mentoring disposition. She gave us a glimpse of a wider life in coffee. And she invited us to see the giraffes in Kenya! Most important, she started as a barista, like many of us, and reading about her trajectory as a coffee professional can be helpful to us all. As a foreign woman of colour to join the industry in a pre-gender/race discussion era, Régine didn’t have many privileges to kick start her career. She began working in a cafe serving commodity coffee at a London museum around 2010, pulling shots on a LaMarzocco Linea Classic. Today she runs a coffee school at origin, judges competitions, is certified by the SCA (Specialty Coffee Association) to teach Brewing, Barista Skills, Sensory Skills, Green Coffee (and soon Roasting!) 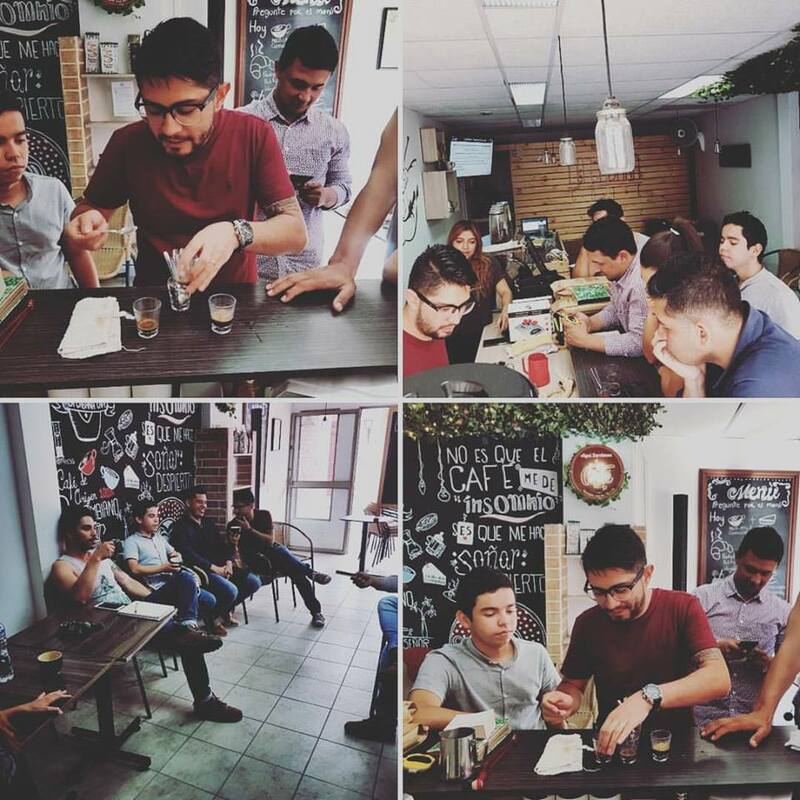 modules and gets paid to travel to train other coffee professionals. We find there are four major lessons to learn after speaking to her. Régine’s first lesson to us was “grab all opportunities you can and make the most of them”. 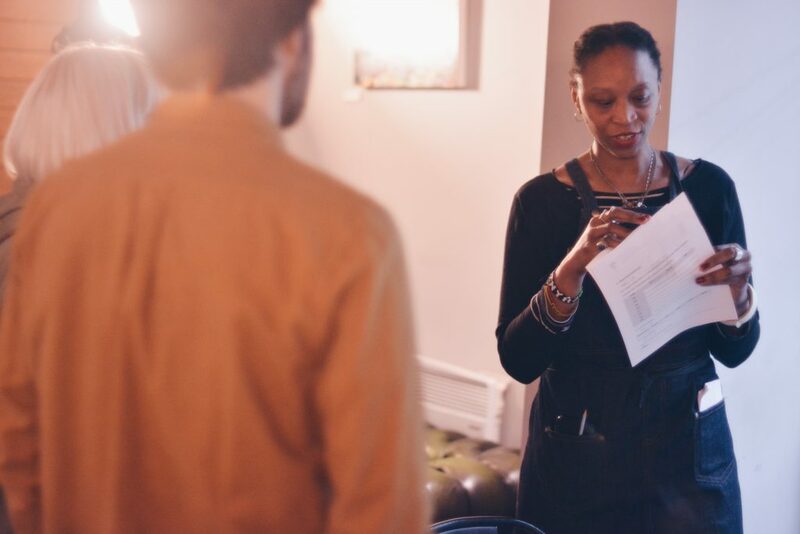 She witnessed the specialty coffee shop boom in London and took the chance to grow with it. At the time she had put herself forward at the museum to help with training and it happened that the education centre was around the corner from Prufrock, where she discovered specialty. She worked to become assistant Head of Training and ran tours with keen members of staff around the best London cafes to taste different origins and talk coffee. That meant more skills, discoveries and a stronger group of coffee geeks around her, which is always good for moral, not to say networking. Years later, feeling a bit stuck and looking into how to move forward, she asked friends in the industry to get her a job at origin, thinking maybe nothing would come of it. But it did. 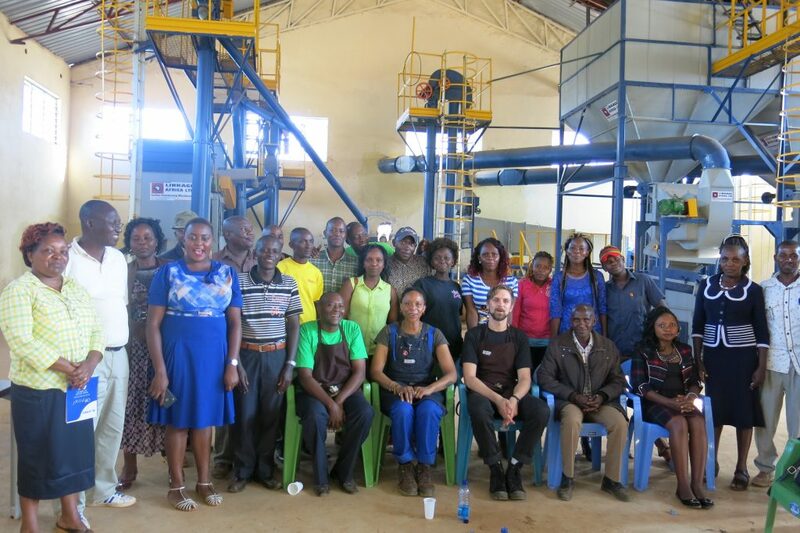 Regine got an opportunity to work with farmers in Kenya and ended up creating her own company, Karibu Kahawa Camps, to run affordable SCA courses for local baristas. She’s also volunteering at farms to learn about agronomy and organising a national brewing and cupping competition for 2019, not to mention the first SCA education camp in Nyeri next March. Of course you can’t ask people to get you a job at origin just like that… Previous steps in her career involved investing a great deal in education and finding mentors to get inspiration from. 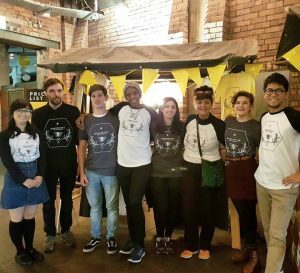 It was Hannah Davies, an AST and one of the organisers of the Manchester Coffee Festival, that introduced Regine to the SCA’s Coffee Skills Program. The two met when Regine was still working with commodity and she soon started saving money for the modules, the path that would ultimately lead her to Karibu Kahawa. Today Regine refers to Hannah as one of her mentors for pointing her in the right direction and later introducing her to the coffee community in Manchester. “My second mentor is Alessandro Bonuzzi from Woof Coffee in Teddington. He encouraged me to quit my job, work in the specialty industry, become a full time AST and add more modules to my curriculum. He also introduced me to the Beanstitute [former name of Karibu Kahawa Barista Camp] and to Rafael Mlodzianowski, who organises the Creators Cup [an internationally renowned brewing competition].” For Regine mentors are priceless – even when they don’t know they are mentoring you. There is a trickier side of the career path for any aspiring coffee professional that starts on minimum wages: money. It’s not cheap getting to the end of the Coffee Skills Program and it’s not cheap to travel before making a name for yourself… Regine’s secret: allowing herself a big overdraught. She funded all her education from her own pocket and had to sacrifice some of her personal life to do so. 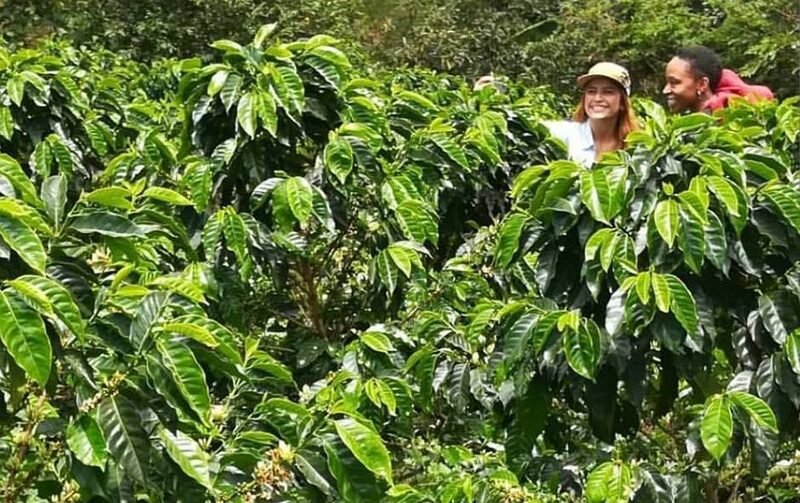 Having a clear focus helped her: “Working in origin with farmers and local baristas who live for (and of) coffee, striving to improve coffee quality and help farmers and pickers get paid properly for their hard work. These are my reasons to live in Kenya, work in Colombia, South Africa and soon Ethiopia and Rwanda”. Another good way of getting experience when money is short – something Regine did too – is to volunteer. “The coffee world is rich in experiences and great people, but sadly not in money. By volunteering in coffee events you help other people in the industry and they’ll help you back by putting you in contact with others who will improve your path in coffee.” Regine’s volunteering at the New York Coffee Festival, for example, led her to be invited to run courses in Colombia a couple of years later.